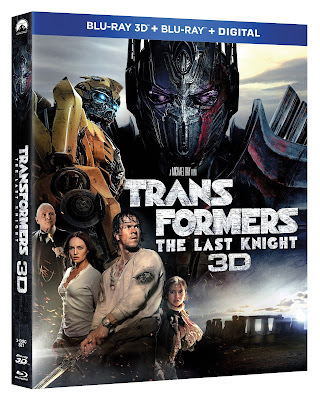 It's giveaway time again and we have copies of TRANSFORMERS: THE LAST KNIGHT (Blu-ray + DVD + Digital HD) to giveaway to some lucky fans. Director Michael Bay’s TRANSFORMERS: THE LAST KNIGHT explodes on 4K Ultra HD, Blu-ray, and Blu-ray 3D Combo Packs September 26, 2017 from Paramount Home Media Distribution. The groundbreaking adventure will also be available as part of the TRANSFORMERS’ 5-MOVIE BLU-RAY COLLECTION arriving September 26. The film arrives two weeks early on Digital HD September 12. (The Fighter) and features a sensational supporting cast including Josh Duhamel (Transformers), Stanley Tucci (The Hunger Games), Anthony Hopkins (“Westworld”), Isabela Moner (“100 Things to Do Before High School”), Laura Haddock (Guardians of the Galaxy), Santiago Caberera (“Salvation”), and Jerrod Carmichael (“The Carmichael Show”). Combo Packs include a bonus disc with over 80 minutes of behind-the-scenes content and interviews. Travel to Cybertron to explore the TRANSFORMERS home world, then visit the UK to delve into the locations used to bring the epic adventure to life. In addition, go inside the secret mythology of the legendary robots in disguise, check out the incredible vehicles used in the film and much, much more. HD release in Dolby Vision™, which enhances the home viewing experience by delivering greater brightness and contrast, as well as a fuller palette of rich colors. The film also boasts a Dolby Atmos® soundtrack* remixed specifically for the home theater environment to place and move audio anywhere in the room, including overhead.